DIYET Pills is one of the natural weight-lowering drugs are very potent and efficacious for weight loss, eliminates fat in the body, and converted into energy and waste the rest in the feces and urine. This is a herbal slimming drug that has proven to be effective to help mothers and teenage mothers who are overweight putrid body. Suitable for removing fat in the abdomen, back, thighs, arms and other leg parts, especially eliminating the fat in the abdomen, thighs and arms. 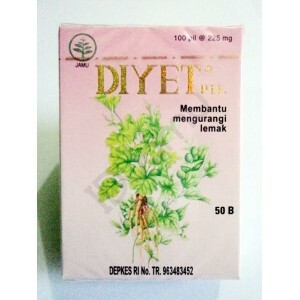 Quick results and no side effects, this is diyet herbal medicine to lose weight and burn fat. Recommended Dosage: Take 5 pills every morning and evening, especially following one's menstrual period. The use of these products must be accompanied by regular exercise and a diet low in calories and low in fat. Pregnant women who are suffering from diarrhea and the pill is prohibited. Many of the consumption of vegetables and fruits to replace rice or noodles, eat plenty of vegetables to be rapidly successful.